What Does a Grey and Yellow Mole Mean ? Should You Worry ? Has your mole always been grey and yellow? Or has it always been kind of grey, and now it has a dull yellow area? 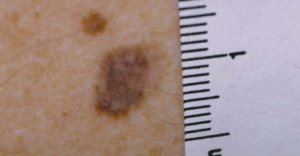 What’s alarming about this is if you know that parts of a melanoma can be yellowish. It’s one thing to know that your mole has been grey mixed with a yellowish hue for as long as you can remember, for years – and especially if nothing about it has changed, such as size or symmetry. It’s a whole new ballgame, however, when you have NO idea how long the mole has looked that way – because you have no idea how long you’ve had the mole. It then drives them nuts when they discover it has features that are listed in melanoma-screening guidelines. 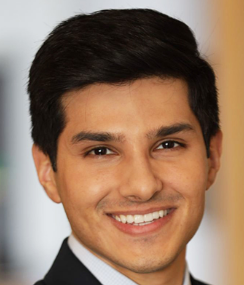 “A grey and yellow mole reflects variations in pigment within individual moles,” says Zain Husain, MD, FAAD, board certified dermatologist and fellowship-trained Mohs micrographic surgeon with New Jersey Dermatology & Aesthetics Center. “Melanocytes produce a pigment called melanin which gives moles their respective colors,” continues Dr. Husain. If you have no idea how long you’ve had a mole that worries you, then have a dermatologist inspect it. If it’s a melanoma, it’s better to get it treated NOW than later. 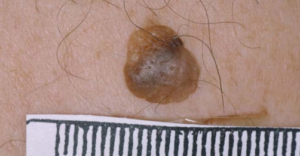 Melanoma is highly curable when caught early. “Seborrheic keratoses and cysts are benign skin lesions that can appear to have multiple colors such as grey and yellow,” says Dr. Husain. 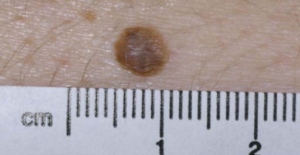 You might also be told, “It looks like skin cancer,” but this wouldn’t necessarily mean melanoma. “Cancerous growths such as basal cell carcinoma, squamous cell carcinoma and melanoma can sometimes have grey and yellow hues,” says Dr. Husain. Basal cell carcinoma is extremely slow-growing and almost never metastasizes. Squamous cell carcinoma is also slow growing (not as slow as BCC) and usually does not metastasize, but if left neglected, can spread and be life threatening. It kills 2,000 to 15,000 U.S. people every year, but many cases aren’t diagnosed until they’re advanced. The lesson here is that if any growth on your skin is worrying you – see a dermatologist. Make sure the doctor uses a handheld lens called a dermatoscope, and have your entire body examined. And if you want the mole biopsied, you don’t have to wait for the doctor to recommend this. The doctor should honor your request. Dr. Husain has extensive training in advanced skin cancer surgery and reconstruction as well as cosmetic procedures including injectables, body contouring and laser surgery. He delivers lectures on dermatologic topics at national conferences. 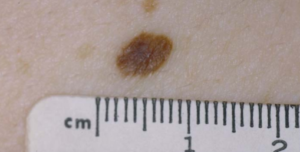 Is a Mole Normal if It’s Brown and Grey or Can It Be Melanoma? How Common Are Grey Moles? 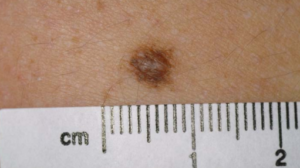 Can a Mole Turn into Squamous Cell Carcinoma?